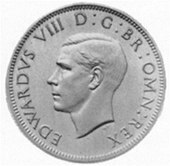 ^ His twelve godparents were: Queen Victoria (his paternal great-grandmother); the King and Queen of Denmark (his paternal great-grandparents, for whom his maternal uncle Prince Adolphus of Teck and his paternal aunt the Duchess of Fife stood proxy); the King of Württemberg (his mother's distant cousin, for whom his granduncle the Duke of Connaught stood proxy); the Queen of Greece (his grandaunt, for whom his paternal aunt Princess Victoria of Wales stood proxy); the Duke of Saxe-Coburg and Gotha (his granduncle, for whom Prince Louis of Battenberg stood proxy); the Prince and Princess of Wales (his paternal grandparents); the Tsarevich (his father's cousin); the Duke of Cambridge (his maternal granduncle and Queen Victoria's cousin); and the Duke and Duchess of Teck (his maternal grandparents). 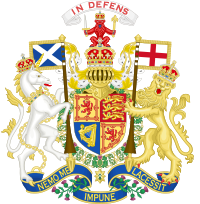 ^ There were fifteen separate copies – one for each Dominion, the Irish Free State, India, the House of Commons, the House of Lords and the Prime Minister, among others. ^ She had asked Alec Hardinge to write to the Duke explaining that he could not be invited to his father's memorial. ^ David Reynolds, "Verdun – The Sacred Wound", episode 2. BBC Radio 4, first broadcast 24 February 2016. ^ Lord Kinross, Love conquers all in Books and Bookmen, vol. 20 (1974), p. 50: "He indeed remarked to me, some twenty-five years later, 'I never thought Hitler was such a bad chap'." ^ "No. 34119". The London Gazette (Supplement). 28 December 1934. p. 15. ^ "Guóa Oficial de España". 1930: 217. Retrieved 4 March 2019. 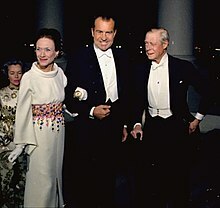 Wallis Simpson, later known as the Duchess of Windsor, was an American socialite whose intended marriage to the British king Edward VIII caused a constitutional crisis that led to Edward's abdication. 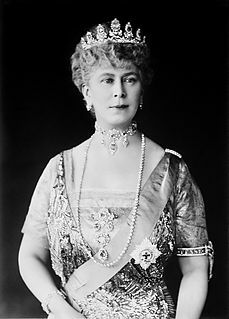 Mary of Teck was Queen of the United Kingdom and the British Dominions and Empress of India as the wife of King George V.
The Duke of Windsor was a title in the Peerage of the United Kingdom. 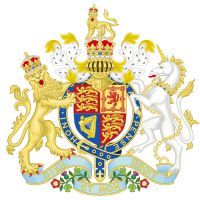 It was created on 8 March 1937, for former King Edward VIII, following his abdication on 11 December 1936. 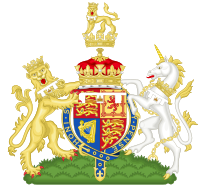 The dukedom takes its name from the town where Windsor Castle, a residence of English monarchs since the time of Henry I, following the Norman Conquest, is situated. Windsor has been the house name of the royal family since 1917. 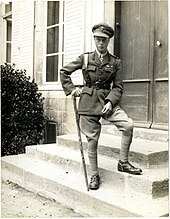 Prince Henry, Duke of Gloucester, was the third son and fourth child of King George V and Queen Mary. He served as Governor-General of Australia from 1945 to 1947, the only member of the British royal family to hold the post. 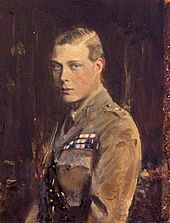 Prince George, Duke of Kent, was a member of the British royal family, the fourth son of King George V and Queen Mary. 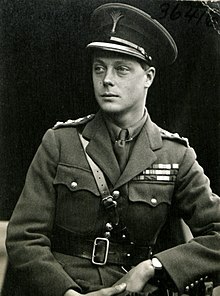 He was the younger brother of Edward VIII and George VI. 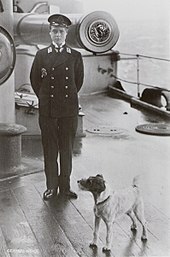 He served in the Royal Navy in the 1920s and then briefly served as a civil servant. 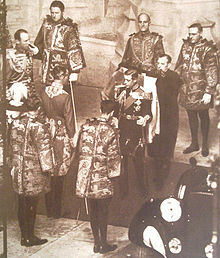 He became Duke of Kent in 1934. In the late 1930s he served as an RAF officer, initially as a staff officer at RAF Training Command and then, from July 1941, as a staff officer in the Welfare Section of the RAF Inspector General's Staff. He was killed in a military air-crash on 25 August 1942. Prince John of the United Kingdom was the fifth son and youngest of the six children born to King George V and his wife, Queen Mary. 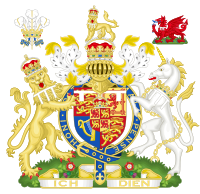 At the time of John's birth, his father was the Prince of Wales and heir apparent to the reigning monarch of the United Kingdom, King Edward VII. 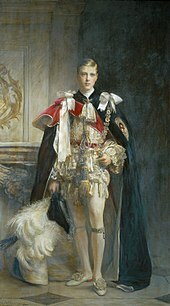 In 1910, George succeeded to the throne upon Edward's death and John became fifth in the line of succession to the British throne. 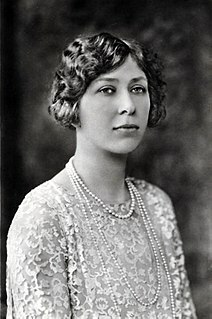 Princess Sophia Matilda of Gloucester was a great-granddaughter of King George II of Great Britain and niece of King George III. 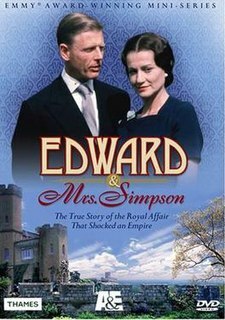 Edward & Mrs. Simpson is a seven-part British television series that dramatises the events leading to the 1936 abdication of King Edward VIII, who gave up his throne to marry the twice-divorced American Wallis Simpson. 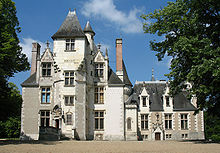 Peregrine Francis Adelbert Cust, 6th Baron Brownlow, often known as Perry Brownlow, was a British peer and courtier. 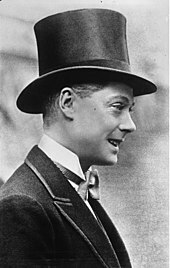 He was the son of Adelbert Salusbury Cockayne Cust, 5th Baron Brownlow, and his wife Maud Buckle. 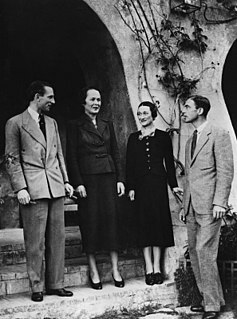 Edward, Duke of Windsor, and Wallis, Duchess of Windsor, visited Nazi Germany in October 1937. 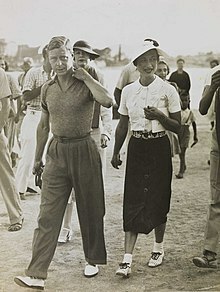 Having abdicated the British throne in December 1936, and married Wallis Simpson in June 1937, the Duke of Windsor announced in September the same year that he intended to travel privately to Germany and the United States to tour factories. His interests, officially into researching the social and economic conditions of the working classes, were also entwined with the looming threat of war in Europe, and it may be that he saw himself as being something in the role of peacemaker between Britain and Germany. 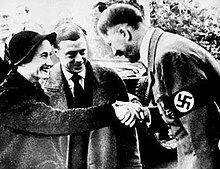 However, the British Government was firmly against such a visit; they suspected—correctly, as events showed—that the Nazis would use Edward's presence as a propaganda coup while revealing nothing to him that they did not wish him to see. However, the Duke was keen that his wife—who had not been accepted by the British establishment—experience a State Visit as his consort, somewhere. He promised the government to keep a low profile, and the tour went ahead, taking place between 12 and 23 October.